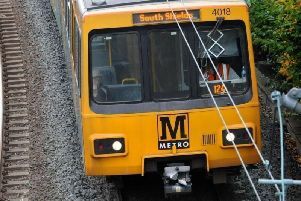 Connor Dodds, struck at Tyne Dock Metro Station. A knifeman is facing a "substantial" jail term for an attack near a Metro station. Connor Dodds targeted his 29-year-old victim at Tyne Dock, in South Shields, on August 4 and caused a serious injury to his face. At Newcastle Crown Court the 25-year-old attacker has pleaded guilty to wounding with intent, which carries a maximum sentence of life imprisonment and having an offensive weapon, namely a Stanley knife, at the station. Dodds, of Northcote Street, South Shields, appeared at the court via video link to Durham Prison. Christopher Knox, defending, said Dodds has been suffering "a good deal of pain" as a result of a lost eye, which he was distracted by during the hearing. Judge Paul Sloan remanded Dodds in custody until he is sentenced next month. The judge told him: "I am directing the preparation of a pre-sentence report and your legal team will be obtaining a psychiatric report. "You should understand, the fact I am adjourning sentence and the fact I am directing the preparation of a pre-sentence report, is no indication of the sentence that will be imposed. "You will understand that a significant custodial sentence is inevitable in the circumstances of this case. "Pending sentence, you are remanded in custody." Police had appealed for witnesses to come forward after the attack, which happened at around 7.40pm on Saturday, August 4. Officers had received a report of an assault near Tyne Dock metro station, at the area close to the underpass at Olive Street. Police said the victim was walking alone when he was attacked, suffering a serious injury to his face believed to have been caused by a bladed article.